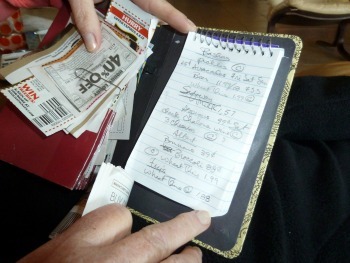 Here is where my frugal wife stores her shopping list and keeps her coupons... every Sunday afternoon she will have this folder out while we're watching sports. She NEVER leaves the house without this folder. One of the keys to planning your shopping, and save money is to do all of your shopping on one day... for her it is usually Thursday, and by making a list of what she wants to buy at each store, with coupons fresh from Wednesday's newspaper... she could teach logistics at West Point on how to do the most shopping with the least amount of gas expended. Shopping for shopping sake, is something we do not do... know what you want, know what you're going to pay, you will save every time. Whenever she shops, she has a purpose, gets what she wants and checks out without distraction... she has made it a game, and almost always gets a raised eyebrow from the checkout person on what she saved. We are both amazed, when some young checkout person says," Everything you bought was on sale"
DUH...don't they teach home economics anymore? We make a few exceptions to shopping on one day only... for instance there are several grocery stores on our route to church... so Sunday morning we sometimes make a stop. Another place to save is in the meat department, where they will have a small section devoted to items who sell by date is that day... and they will offer these items at really good savings, usually 50% off minimum. It's where we get a lot of our steaks, they usually go into the freezer first, but sometimes we will enjoy them that very day... make sure these items do not go into the refrigerator, either freeze them or consume them that day. 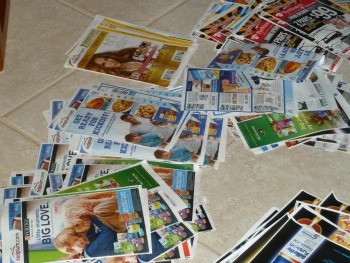 This is what the floor in front of her recliner looks like on Sunday afternoon... sorting through all of the ads and coupons in the Sunday paper...it has become a ritual, and one that has saved us countless dollars over the years. You should look at your Wednesday and Sunday paper as a source of controlling your budget as well... that's where the specials are advertised along with the coupons... take advantage of it. Are you still curious why I could retire in 1994? Thanks for reading how to plan your shopping...it will save you money.